The BorderMovement AV-lab is an experimental eight-day artist residency that assembles an experienced group of visual technologists from India, Pakistan & Sri Lanka, to develop new ideas, exchange knowledge, and realize immersive experiences. The results of the AV Lab will be presented at Sub_Sequence 2018 in collaboration with musicians, artists and technologists from Sri Lanka. 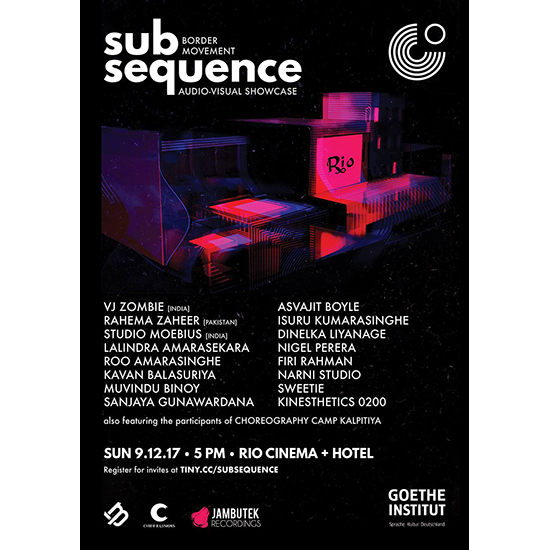 Featuring interactive audiovisual installations, musical performances and mixed-media art, Sub_Sequence will transform the grimy cinema halls, corridors, swimming pool and derelict rooms of the partially-abandoned Rio Cinema Colombo into a melting pot of interdisciplinary artistic collaborations waiting to be explored and experienced. Also featuring spontaneous bodily interventions by the dancers, performance artists and theatre practitioners from the Choreography Camp Kalpittiya 2018. Invites can be collected in advance from the Goethe-Institut Sri Lanka or at the gate on the evening of the show.